Access Steps offered comprise wide selection of standardized access steps that provide for superior usage values. Featuring modular designs, these are also economical and deliver longer service life. The use of weatherproof aluminum construction as well as static analysis for entire system also helps in providing for high degree of usage safety. 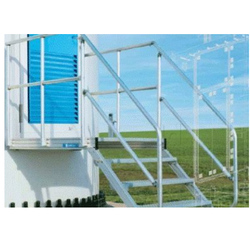 These access steps also meet US standards: OSHA 1910.24 as well as EU standards. Looking for Customized Access Steps ?